Measuring for your Septum Clicker! 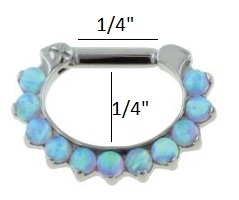 Are you ready to purchase that Septum Clicker you have always wanted!? Well this is how you measure your septum for your new fancy clicker! 1 - You should already know your gauge size. If you do not you will need to go to your local Piercing Shop and find out your correct gauge. 2 - With a toothpick, align the tip of the toothpick to your gauged hole, then measure and mark on the toothpick where your septum ends below your nose. 3 - Measure the mark with a ruler, gauge wheel. The smallest clicker is 1/4" x 1/4" If your Septum is exactly 1/4" from your gauged hole to the mark on the toothpick the Clicker will be a snug fit. If your measurement is smaller than 1/4" the clicker will be a looser fit and you will have a gap.